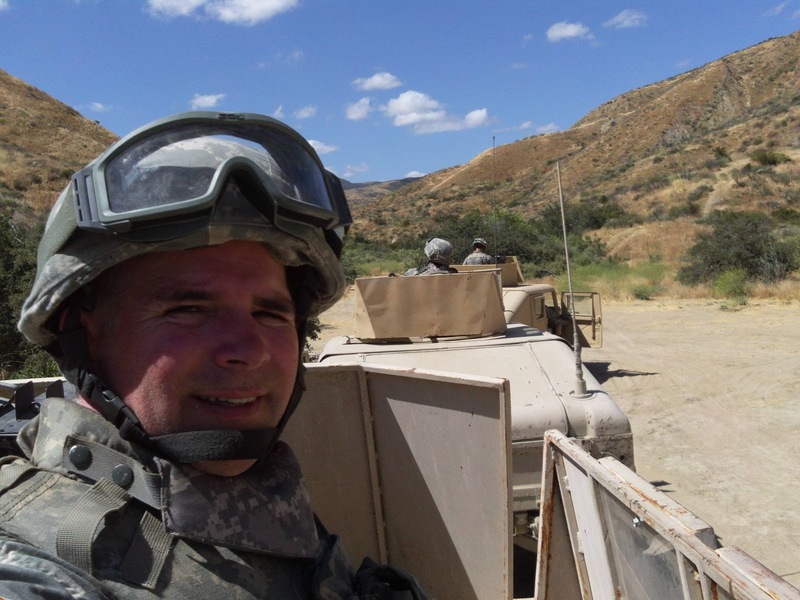 Author/ultramarathoner blog "Whatever you do, do it with all your might as unto the Lord..."
Last year in June I was in California at a studio ranch outside Hollywood for two weeks acting the part of a US Army soldier in the movie INDIVISIBLE. A lot of energy and sweat went into those days on set running around in full US Army body armor climbing in and out of Humvees. Sometimes explosions went off around us as we did this. You can read more detail about my experience including the miraculous way I was able to be involved in this in a blog I wrote back in July of 2017 HERE. It released at 830 theaters this weekend across the USA and debuted just outside the top-10 at number 13, below the new Rowan Atkinson release, 'Johnny English Strikes Again'. On the 'Tomatometer' presently it's 95% liked by audiences and 69% Fresh (Check here TOMATOMETER). Overall INDIVISIBLE is getting good reviews. I was able to see an early preview in an online screening and was amazed at how the production turned out. 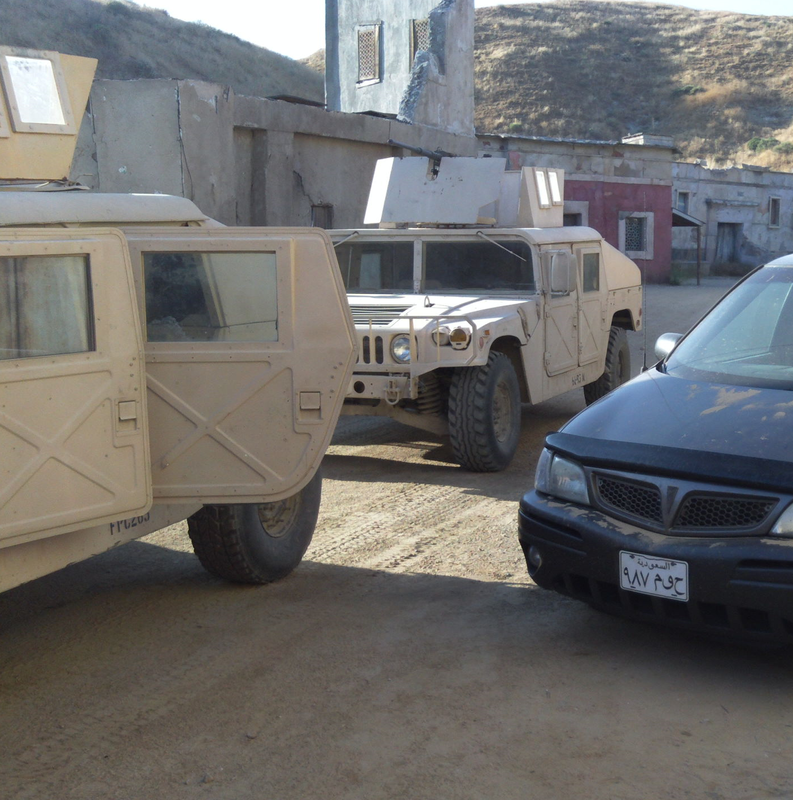 Even though I was on set for many of the scenes that were to have taken place in Iraq 2007, and could remember what was going on behind the scenes, I found myself emotionally caught up and moved by the film. Sarah Drew and Justin Bruening do a powerful job portraying the main characters Darren and Heather Turner. All the supporting cast are strong too, including Skye P. Marshall who plays Sgt Shonda Peterson. 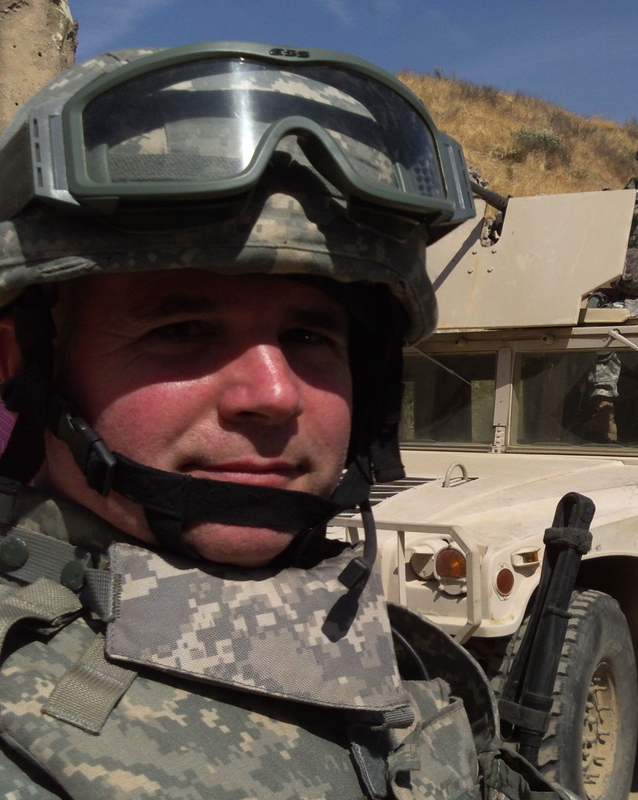 The director David Evans doesn't shy away from showing the raw realities of a war zone. 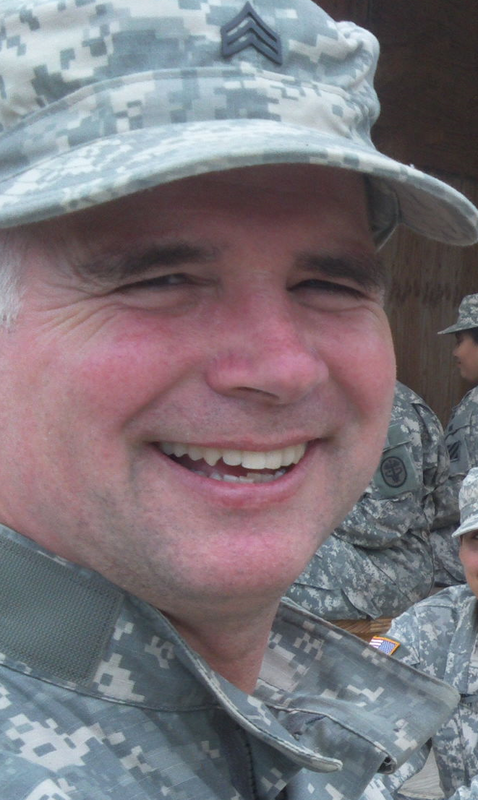 He takes you into this Army chaplain's emotional ride as he deals with the suffering and loss of his brother's in arms - how it changes him while he's there and when he returns home. I felt passionate about being involved with this production because I've had friends who have struggled with post traumatic stress (PTSD) due to what they've experienced on deployments with the military. INDIVISIBLE offers hope to those who are struggling in this way showing that healing and reconciliation is possible. I had such a great working experience on INDIVISIBLE I'd do another film like it again in a heartbeat. I was on my usual long mountain run on Saturday morning following the steep, winding, logging road up Cumberland Mountain, when I was overcome by the beauty of the view below. As I gazed out at the fir-tree forests, and beyond that, the Georgia Strait, separating Vancouver Island from the mainland, and the Rocky Mountains silhouetted across the horizon in the early morning sun, I felt I just had to take a photo. I stopped near the summit to remove my smart phone from my backpack, powered it up, aligned the view finder, and took the best shot. When I turned around to take another photo of the trail ahead, I spotted a black bear, not too far off. It was eating ripe black berries from the bushes at the side of the logging road. I took a shot of it too, and then, quietly, I backed away, moving down the steep hill I had just run up, thinking, "If I hadn't stopped to take that photo I would've had a close encounter with a black bear." Since I was up at the summit so early, there weren't other bikers or trail runners around. I descended the mountain the same way I had come, quickly, hoping that the bear was not alerted to my presence. I checked over my shoulder a couple of times to make sure that I wasn't being followed. 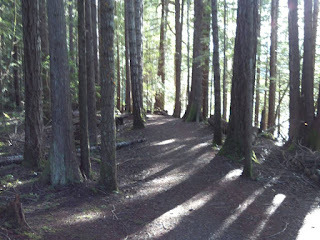 I was relieved when I got back to the lower trails where there were plenty of bikers and dog walkers. 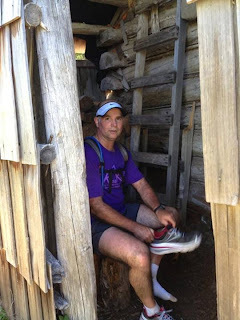 Since 2015 I have been running the Cumberland Mountain trail system. I had seen posters with cougar and bear warnings, but had never had an encounter or even spotted one. I had seen evidence of them like tracks and dung. 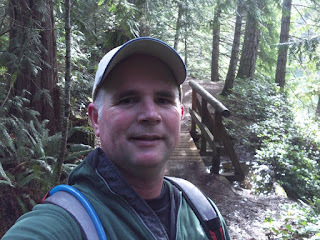 My only other encounters with bears while on trail runs were on the Pipe Line Trail north of the Stotan Falls bridge, and the Cape Scott Park trail on northern Vancouver Island. In those incidences I was making enough noise that they knew I was there, and they took off. - Make noise; sing, shout, wear bear bells. - Use trails frequented by dog walkers (dogs mark their territory). - Avoid trails where berries are ripe. 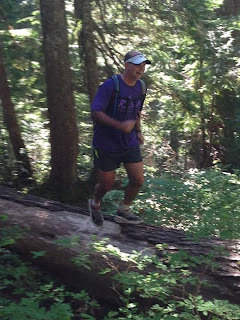 To celebrate my 50th birthday I planned to run 50 miles on a 10km circuit route (8 x 10kms) nearby in Comox, B.C.. With 216 feet of elevation gain per loop I would end up with a total of 2,777 feet elevation gain. I hadn't considered that ice and snow would be a problem since the temperatures at sea level on Vancouver Island are usually mild mid winter. However, as the day drew near for the run a high pressure weather system moved over much of Canada producing record low temperatures east of the Rockies. The day before my planned running date, my birthday, December 31st, snow fell, and black ice became a problem on several sections of the route. To finish before the sunset I would have to start before the sunrise. This meant I had to wear a head-lamp. I wondered how I would navigate the snow and black ice with a head-lamp for over two hours. I would have to be cautious. Near 5 a.m. I set off running alone from my self-serve aid station at Point Holmes, heading west along a coastal trail that wound along beside the beach. Snow fell, flashing in front of me in the brightness of the head-lamp. Heading up the edge of Lazo Road, I could see ahead about 4-5 metres, and dropped back the pace when I encountered black ice. Once onto the sidewalks on Guthrie Road I was out of the woods and had much better visibility. There were some good climbs coming up Guthrie and Pritchard Roads that took some work. At the top I was encouraged by the thought that when I switched directions for my next loop after my aid station I would be coming down the same hills. I had to take things cautiously in the dark on Knight Road as there were long sections of black ice and uneven patches of snow on its shoulders. The sun came up on my third loop so I could take in the ocean and mountain views the route had to offer. Upon completion of this I was met at my aid station by my wife, Olivia, with a bacon and egg sandwich and veteran marathoner Ken Richardson who would pace me around to the halfway point. It was good to have someone to talk to, as this helped the miles to fly by. He gave me some advice on how to mentally move through the final 40kms. When we reached my aid station at the completion of this stage we were greeted with cheers by a group of members from the Comox Valley Road Runners. One of them asked me how long I had been training for the run and Ken Richardson answered them, "He's been training 50 years for this one." Before I left on the fifth loop though they sang "Happy Birthday" to me. They had a delicious spread of desserts and drinks laid out. I would've liked to stay longer with them to enjoy the tailgate party but I had to keep moving so my legs wouldn't cramp up. To get through the second half of the 50 miles I mentally divided the remaining distance into aid station stops. With only two remaining, I felt a burst of energy and optimism. "I can do this," I thought. While running loop six I passed a tow truck pulling a 4x4 truck out of a ditch. It had spun off of Knight Road by Siefferts Farm Market. Black ice was still a problem in the shade. I had to be careful. Ken Richardson found me at my aid station as I was preparing to start the final 10km loop. Because he had an appointment at 4 p.m. he could only run with me for the first kilometer or so. Before turning around he encouraged me that I was in good shape to reach my goal. With a great sense of joy and accomplishment, as the sun set over Mount Washington, I arrived at Point Holmes. I didn't realize how cold I had become until I got home and was helped into a warm bath by my wife. I went directly from there to a bed under three blankets. I turned on the room's electric heater (unusual for me). It took me a couple of hours to calm the chills. Nutrition: Ensure protein drink, Mars chocolate bars, Cliff gels, bacon. For the past two years I've been running The Cumberland Mountain trail on a weekly basis and I just don't get tired of it. It's always a challenge, an adventure, and leaves me whacked after running its hills for hours. I guess that's why it's number one on my list. Numerous entrances to the trail system are found at the edge of the Village of Cumberland. I prefer to park my car in the recreation centre parking lot off Dunsmuir Avenue, its main thoroughfare. From there I run down Sutton Road to the Cumberland Community Forest. Hours of challenging fun can be had running the hilly logging roads and mountain bike trails.It takes about an hour to reach the summit after ascending 1200-1400 feet. The views on a clear day are inspiring. You can run 2-5 hours through the vast Cumberland Mountain trail system. Make sure you bring extra fluids in the summer as the streams dry up and it can get hot in the back hills. Watch out for roots and rocks on the secondary trails, and make noise as bears and cougars have been spotted on some of these (I've never met any). The Riverside/Nymph Falls trail system covers close to 20kms if you follow it full circle. Running along beside the edge of the Upper Puntledge River through mostly evergreen forested areas it offers many beautiful views where you will be tempted to stop and rest to enjoy the scenery. West of the Inland Island Highway the trails can be a challenge on the north side of the river especially in the rainy season. A 2-3 kilometer stretch back up toward Nymph Falls follows a narrow mountain biking trail with many wooden bridges that get frosty in the winter months. But with rolling hills, several outhouses, and well groomed pathways throughout most of it, the circuit is a pleasure to explore. Access the trail head by vehicle either through Forbidden Plateau Road, Nymph Falls Nature Park or park at the end of Powerhouse Road in Courtenay and run west beside the cement hydro tubes (15-20 minutes) to the Duncan Bay Main Line Road. Continue on following the hydro tubes up hill and you will eventually join the Riverside Trail on the east side of the Puntledge River. If you cross the bridge following Duncan Bay Main Road over the river after 50 metres or so on the left you will see the narrow entrance to the Riverside Trail. 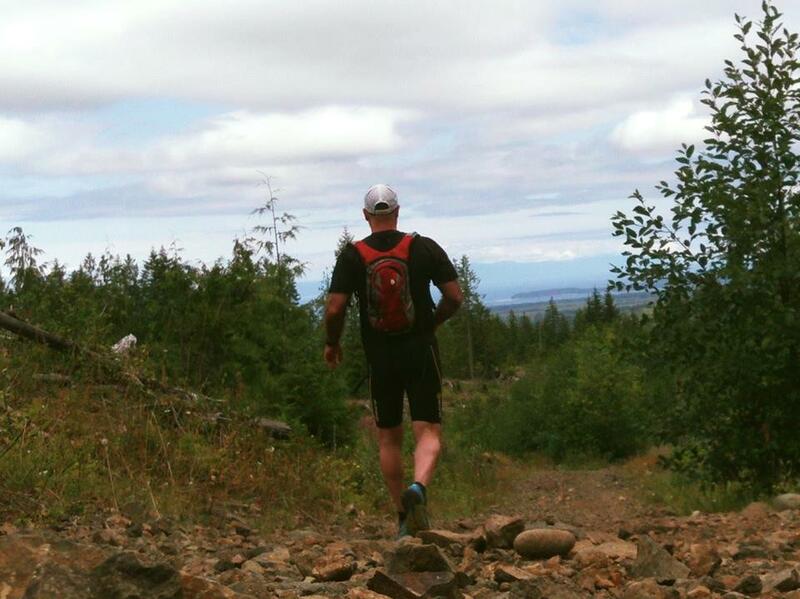 Running this challenging trail is best done in the dryer months. During the rainy season sections of the trail are submerged by swamp and may be impassable. If you're running with a friend you can both meet up in separate vehicles either at the parking lot at the top of Forbidden Plateau or by Raven Lodge on Mount Washington. Leave one car behind and travel together in the other vehicle to the opposite end of the trail. To run this it will take 5-7 hours. There are some sections that are steep and technical with roots and rocks where your pace will be reduced to power-hiking. I usually wear a pair of gloves to protect my hands, and a camel pack with 2 litres of fluid, energy gels, and snacks. #4, Lazo Marsh Northeast Nature Trails: To access this trail system there's plenty of parking to be found behind Highland High School off of Guthrie Road. I like running here when I want to get in an hour or so of trail training on varied terrain. 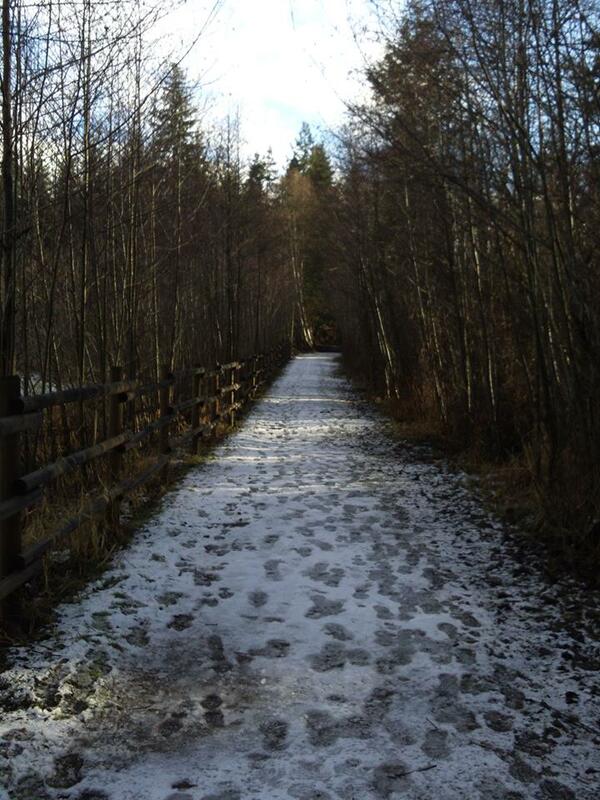 There are close to 10kms of paths winding around the Lazo Marsh Northeast Nature Trail. It's a mix of rocky, root filled, and well groomed trails. There are some good short hills to test your stamina. The surroundings are beautiful with several old growth trees in the lower sections. Watch out for dog walkers. Give them plenty of warning so their pets aren't startled. 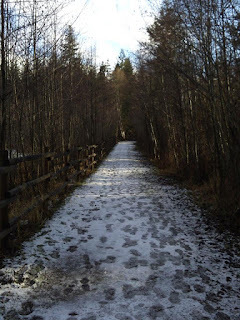 #5, One Spot: One Spot trail is an easy, well groomed, trail that for the most part follows an old lumber railway that once bore the same name. It passes by farmland where cows and horses can be spotted. Hedge groves along the way provide shade. 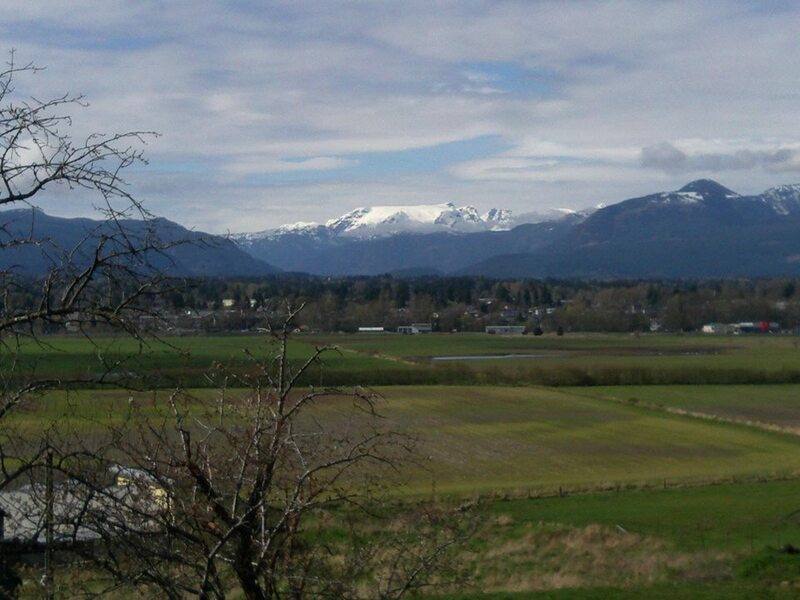 Running out to the end and back from the Condensory Road Bridge in Courtenay can take around 2 hours. The trail head is located near River Meadow Farms on Condensory Road. I've had to share the trail with horses on several occassions. It's best to step aside and let them pass. #6, Seal Bay Nature Park: The Seal Bay Nature Park trail is divided by Bates Road, where you will find the best place to park. Most of the trails are well groomed, and there are outhouses and directional maps stationed throughout. The circular Horse Bike Trail offers the longest run at around 7kms. But don't stop there, cross over to the east side of the trail system and take in the awesome ocean views from the trails that snake along the cliff side there. There are stairs that lead down to the beach, if you would like a challenging stair workout. 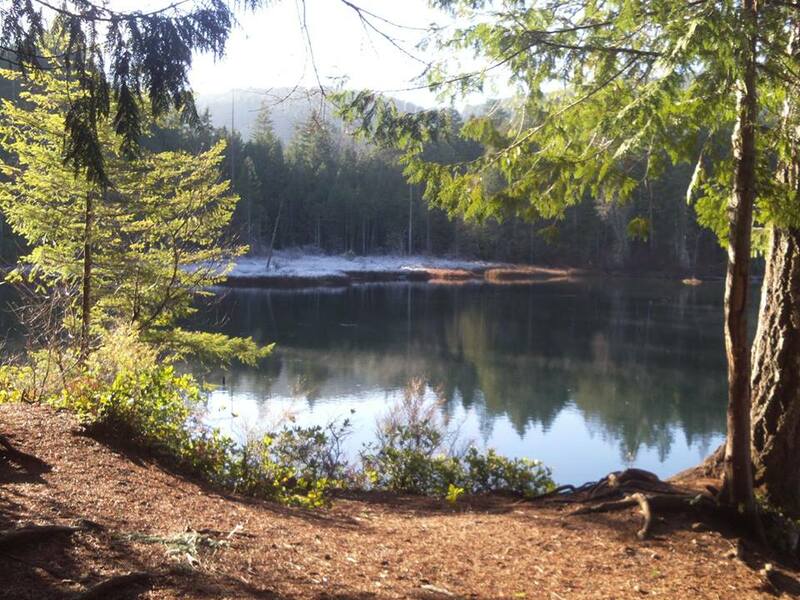 The Seal Bay Nature Park trail is a great beginner trail for a road runner interested in making the transition. CAUTION: For the Cumberland Mountain Trail and Riverside Trail systems I recommend that ear bud type music listening not be used as this may interfere with hearing oncoming mountain bikers and avoidance of wild animal encounters. When I think back to last month when I had the privilege to act as a U.S. Army soldier in the film INDIVISIBLE, I am amazed at how the whole opportunity came about, and how well the shoot was completed. It began with an e-mail I received from the film's casting department on May 26th. They were looking for healthy background actors to play U.S. Army soldiers in California. The plot summary intrigued me. 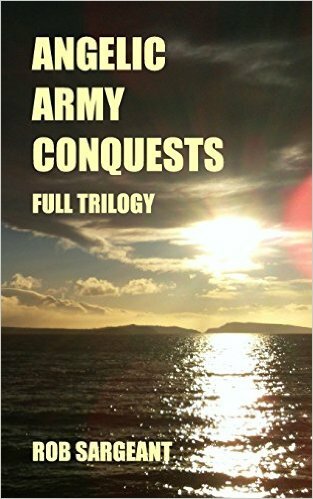 It was a war drama about an Army chaplain who suffers with mental trauma after a long deployment to Iraq. This almost ends his marriage. Throughout my 15 year career in the Royal Canadian Air Force I have had friends with similar stories. I knew of the Director, David Evans, from the first film he made, GRACE CARD (I had watched it several times, and had been moved by its intensity and emotion). Also, Sarah Drew, the Executive Producer, was familiar to me from the movie MOM'S NIGHT OUT. Bob Scott, the director of photography, is known for his work on WAR ROOM, FIREPROOF, and the NASHVILLE TV Series (as camera operator). The following Sunday I prayed about the casting e-mail with a friend at church and had confirmation through a vision that we shared that I should pursue this further. There were three problems though: the movie ranch where they were shooting this for ten days in June was over two-thousand kilometers away; I didn't have enough money saved up to afford the trip down south, and our unit at work was having a formal mess dinner which no one could take leave from without the submission, and approval, of a memo. I wrote up the first draft of my memo and leave pass, and submitted it to my chain of command the next Tuesday. In order to make it to the first day of filming in California the latest I could leave Vancouver Island was by early Saturday morning, June 3rd. Thursday, June 1st, I got some encouraging news; I was getting a 6% pay raise, with three years back pay. I would now be able to afford the trip down to California. At work my memo went up the chain of command all the way to the Major. Friday, June 2nd, around noon, I received the signed memo and leave pass. With the encouragement of my superiors, and co-workers, I left for home at the end of the day, making a mental list of the items I would need for the long drive and stay in California. The next morning, around 9:30 am, I crossed the border into the U.S.. My van was searched, and I was interviewed by a Customs and Immigration Officer who seemed to think my reason for traveling was a little odd. I showed them my approved leave pass, the e-mail inviting me to participate in the film, and the memo. These documents all backed up my story. I was approved by U.S. Cutoms to gain entry. I was happy to find out that whoever searched my van ended up fixing the automatic passenger's side window that was stuck. Over the next twenty four hours, along with a couple of short naps, I made it all the way to a rest stop just south of San Francisco. I phoned my wife, Olivia, from there to let her know that I had made it safely that far. Seven hours later I was at a campsite near Castaic Lake, just off the I-5. It was the perfect spot; quiet, yet a short drive away from a busy truck stop with restaurants, and a 7-11 store. From there, it was a thirty-to-forty minute drive to the Blue Cloud Movie Ranch where I'd be volunteering. I arrived to the set early on the first day of shooting. The Hollywood Catering van was setting up for breakfast outside the building that would serve as our cafeteria and holding area for actors, crew, and extras. A row of tables set up just inside the door was spread with craft foods. The smell of French toast and fresh brewed coffee wafted into the air. Four rows of make-up, wardrobe, and cast trailers were parked in the next parking lot where I was told to leave my van. The 2nd Assistant Director found me there and directed me to wait in the cafeteria where a few of the other volunteer actors were seated. I was surprised to see so many crew. It takes a lot of people to make a feature film. After signing release paperwork a group of us were taken to get costumes and make-up done. Being in the Canadian Air Force my hair was already at the right length for a war drama. One of the men in our group had to get clipped. Because I don't want to give away any spoilers in this blog, I can't go into the details of the scenes we shot over the course of the ten day shoot. I can say it was a lot of physical work. I felt that the cast and crew I worked with over the twelve-hour long days became like a family. The Director, Executive Producer, Producers, Director of Photography, and starring cast, were patient and kind to us. Though many of the scenes I was involved with were intense and emotional they would inject enough humor from time to time to keep things fun. Though we came to be volunteers a background actors we were given opportunities to play featured acting parts. Nathan Kimball, one of the volunteers, had his first speaking part in a feature film on this picture. Throughout the shoot in Santa Clarita in several scenes we were honored to work alongside some veteran Hollywood actors, many with the common trait that they had acted at some point in their career in the ABC TV Series GREY'S ANATOMY. As volunteers we were given privileges. A big bonus was being able to eat from the Hollywood catering food truck. Freshly prepared salads and hot meals twice a day helped to get us through the long days. I especially liked 'Taco Tuesdays' when beef burritos were served. During the final days of the shoot in Santa Clarita it became very hot. Thankfully someone arranged to have natural frozen fruit Popsicle, and a freshly cut fruit, vendors stop by. As talent we felt appreciated. Sunday we had the day off so I went to CBS Studios in Studio City to meet up with an old friend, Kevin Renel, who was the best man in my wedding in Pasadena in 1990. He was part of a Christian film artists' fellowship that met for prayer and worship in a small studio on the CBS lot. Before the service started I stopped at a cafe on Ventura Blvd for a dark roast coffee and sat on the outdoor patio taking in the view of the tall palm trees that lined the street. It was nice to relax after working so many 12 hour days in a row. The most blessed part of being involved in the INDIVISIBLE movie shoot was meeting other Christian volunteers like myself, who were invited, and felt led to serve in this production. They saw it as ministry. I was able to pray with some of them as we waited for the camera and lighting crews to set up. At times we felt God's presence on set. Hopefully this will carry over to the audience after its theatrical release in the Fall of 2018. Watch it then, and you will find out. Below is the first trailer. Last month my wife and I traveled down the west coast of America on the I-5 to visit relatives near San Diego. Along the way we stopped for a couple of days in Auburn where the finish line of the famous Western States 100 Endurance Trail is located. This involved taking a slight detour north/east on highway 80 in Sacramento. A local working in at a cafe in Old Historic Auburn was able to give us directions on Google Maps to the high school football stadium track on Stadium Way, the precise location of the Western States 100. My wife and I soon found Robie Drive and drove down the winding steep road to Robie Point park to scout out the trail head. Since it was already late in the day we decided to find a hotel. The plan was that the next day I would run an out and back of three hours from the Auburn finish in the morning. This route included some good hill climbs and would give me a 12 mile taste of what the Western States 100 competitors had to face. Because I was alone we decided it was best for me to take a small two-way radio with a 20 mile reception radius. The temperature was to reach near 80 degrees in the canyon the next day so I took along 1.5 litres of water with 2 dissolved Nuun tablets. After enjoying an evening visit to the Auburn Running Company store (featuring WS100 memorabilia in its front window) and the Pub across the street on Lincoln Way, we spent the night in Motel 6 off Auburn Ravine Road. While there was still coolness in the morning air I set off from the stadium gate at Stadium Way and headed up Finley Street. Following Marvin Way and Robie Drive I descended to the Robie Point trail-head. With clear skies, and the early morning sun rising over the hilltops to the east I continued on running the wide Western States Terrace trails that switched back and forth into the canyon. The trail narrowed, and became much steeper after leaving the terrace. A rainy winter had the creeks and rivers filled. 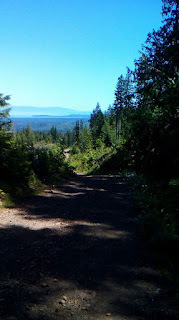 I ran on tree shrouded, muddy trails, pock marked with horse hooves, for the next 1/2 mile, descending into the canyon. Before long, I was back into the sun. I could see the North Fork American River below. I knew that No Hands bridge crossed this somewhere ahead, so I ran along with confidence, passing a waterfall on narrow wooden bridge. It was so beautiful, I had to stop and take a photo. After crossing No Hands Bridge I took a sharp right turn onto a trail that ascended up into the forest. I was starting to feel the heat so the shade was welcomed relief. Switchbacks led up the hillside until I came into a clearing that gave me a great view of the Highway 49 bridge over the North Fork American River. On the far side of the clearing I met up with some runners headed in the opposite direction. We exchanged greetings. I noticed one of them had a two way radio strapped onto their camel pack. I had to be careful on the switchbacks beyond this as I crossed over several creeks balancing on rocks so I wouldn't get a my shoes soaked. Before I knew it, it was time to turn around. I was one hour and forty five minutes into the run when I arrived at an open plateau where the trail branched off in two different directions. That's where I decided to turn back. The descent back toward No Hands Bridge was fast. I felt the the midday heat near eighty degrees. I tried to imagine what the WS100 racers would feel like when they reached this point in the endurance run with one more ascent to endure, up out of the canyon, to Robie Drive. It must be a great sense of relief. I felt a taste of it as I came down Finley Street after following the small spray painted WS100 foot steps that marked the trail as it wound through the city streets to the finish. I was fifteen minutes later than I had planned getting back to the Stadium Gate. My 12 mile/three hour taste of the Western States Endurance Trail had left my legs burning. My wife treated me to a bacon cheese burger at Local Heroes in Auburn so I could get a good boost of carbs. I had booked another night at our motel knowing that I would need it to rest and recover. My foresight was true. While I wrote the trilogy, Angelic Army Conquests, I found Google Maps Street View to be a great tool for research. Using this, I was able to travel to Israel, and walk the narrow streets of Jerusalem where the climax of this post-apocalyptic adventure played out. It allowed me to accurately describe the architecture, directions, and street names, that my fictional characters encountered. While editing my first book, Lost Ark Found, I sought out the advice of experienced writers, and one of the common things I heard them say was, "Write what you know," so that's what I did. 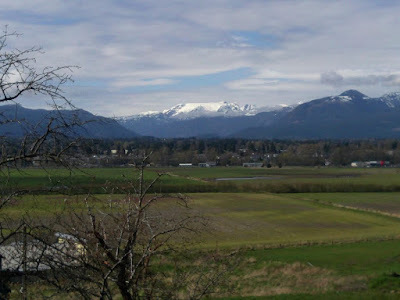 My third and fourth fictional books, Dance With Me, and, In Heaven, were set, for the most part, all on, or around, Vancouver Island. My wife and I would sometimes take day trips to do research at the locations on the island where my stories were set. We talked with the locals, hiked the trails, and stopped for a snack at the small town general stores. Being physically on location to do research helped to add to the authenticity of my writing. Seeing a sunset, or meeting a quirky person, can spark a bunch of creative writing ideas. But when I couldn't afford to travel to Washington D.C., the Middle East, or Koro Island in Fiji, to do research for the Angelic Army Conquests trilogy, Google Maps Street View helped me to get there.